For as long as I can remember my family has been stopping at Trey Yuen. 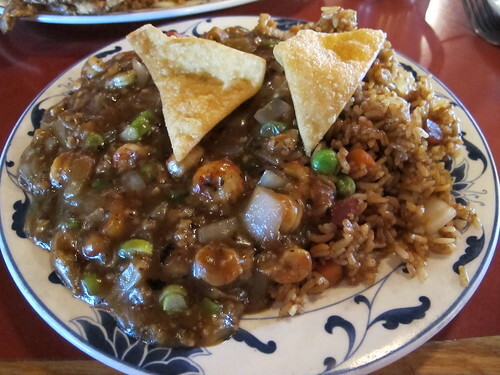 I know it seems odd stopping at a Chinese restaurant in Hammond, Louisiana, but my childhood is littered with memories of trips to Houston that almost invariably included a stop at Trey Yuen. Even today, if anyone is coming back from Houston, New Orleans, or Baton Rouge, they’ll almost certainly return with a few bags of takeout from Trey Yuen. Of course that doesn’t answer why my family always stopped at Trey Yuen, but I think it goes back to their days in New Orleans. I have vague, uncertain memories of Trey Yuen being situated on the top floor of Jack’s Brewery. If I remember correctly the landlord raised the rent exponentially one year and as a result the Wongs moved shop to Hammond. While I may be a little shaky on my recollection of Trey Yuen’s origins and our mild obsession with them, I certainly remember their presence at a number of Quarter Fests. There, in the middle of Jackson Square, one of the Trey Yuen chefs would manhandle a giant wok and dole out individual portions of their relatively famous crawfish with lobster sauce. It may have been a bit odd seeing a stand selling Chinese food amidst the booths chock full of other New Orleans favorites, but it always worked for me. It’s been a number of years since my last Quarter Fest, but Trey Yuen is still a constant figure. That might explain why, on a recent day trip to Lafayette, I pulled off I-55, parked in the bamboo shaded lot, and strolled past the Foo Dogs into the foyer of Trey Yuen. The interior is over the top Chinese, but in a good way. There seems to be miles of carved wood everywhere; each piece covered in a red lacquer. The hostesses and waitresses wear silk dresses and shirts. There’s even a lush courtyard with a pagoda in the middle. All greenery and appointments aside, there’s no better way to start a meal at a Chinese restaurant than with dumplings. 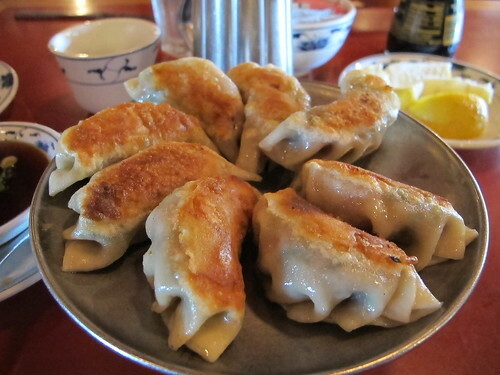 At Trey Yuen, that means an order of Pot Stickers. With a thick, doughy wrapper, it’s perfectly crisp on the bottom and steamed on the top. 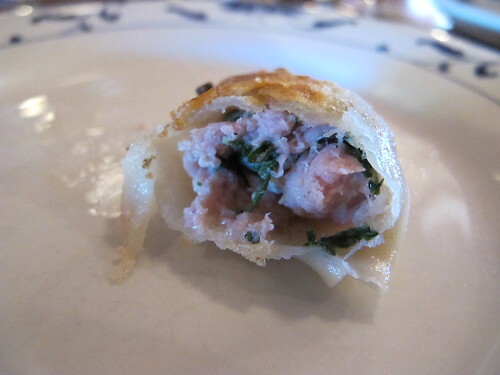 The filling has a simple taste of ginger, pork, and green onions. 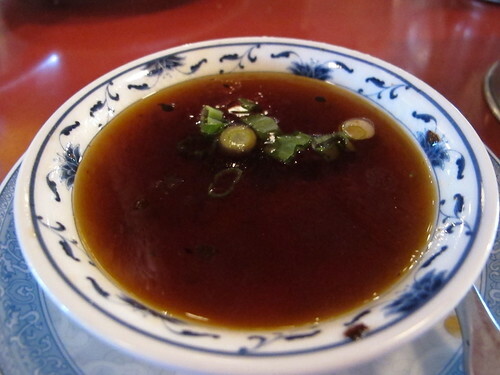 A bowl of the accompanying dipping sauce is equally simple and tasty. I’m guessing there’s soy sauce, rice wine vinegar, sugar, and of course green onions in there. 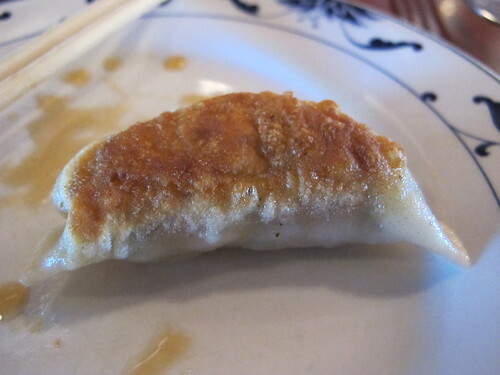 Even though the doughy texture of the wrapper gets old quickly, I can’t help but order the pot stickers. Despite its absence from the lunch menu, the staff at Trey Yuen is more than happy to serve a lunch portion of Crawfish in a Spicy Lobster Sauce. Listed under the "Fresh Local Specialties" section of the menu, this is far and away my favorite dish at Trey Yuen. 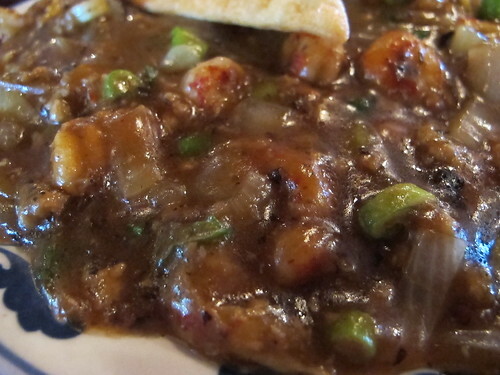 It's an army of frozen crawfish tails swimming in a sea of cornstarch thickened, black bean based lobster sauce. Each bite has a touch of brine and is punctuated by the crunch of a onion and the tender flesh of crawfish. Served with a side of buffet fried rice that's laden with chunks of char siu, the Crawfish in a Spicy Lobster Sauce may not be the pinnacle of Chinese cuisine, but it's got a Louisiana twist that makes it an eternal favorite. Over the years, I have tried the bulk of the Trey Yuen menu, especially the "Fresh Local Specialties" section, but I want to try something new and that day's special seemed like the perfect dish. 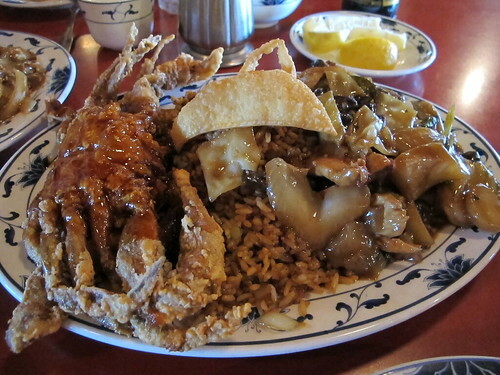 Labeled as the Two Happiness Plate, it's a massive portion of fried soft shell crab, an order of Four Happiness, and plenty of fried rice. Served with plenty of "Tong Cho" sauce, these crabs were large and juicy with a distinct briny taste and an odd batter. I've had various encounters with the Tong Cho sauce and each time I find it too sweet and reminiscent of pineapple. 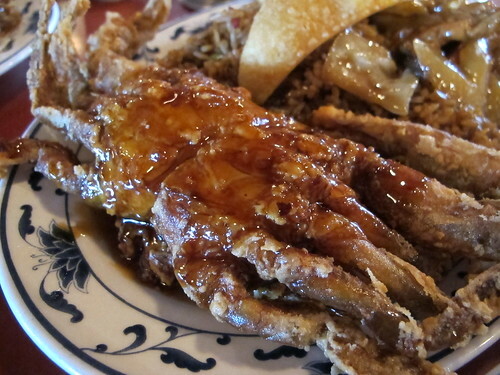 It doesn't matter what seafood it's served with: crawfish, soft shell crabs, or alligator, each and every time the Tong Cho sauce dominates the dish and makes it an unpleasant affair. As for the Four Happiness, this is a grab bag of meats. With pork, chicken, beef, and duck all in the mix, nothing stands out, it's just a serving of some meat. Along with the cabbage, corn, and water chestnuts, everything is served with a simple starch and soy sauce based sauce. At the very least, it's the better part of the Two Happiness combination. 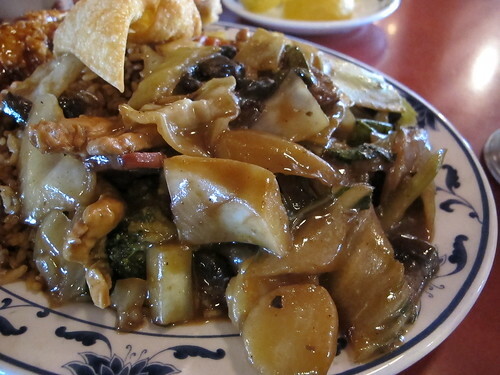 Like most restaurants, there are some glaring weak points in the Trey Yuen menu. Every time I stop there, I try and order something new and different, but outside of the Crawfish in Lobster Sauce, I've found it's best to stick to the familiar favorites, the Pepper Steak, The Mui Shui Pork, etc. Unless you like the sweet stuff, I'd stay away from the Tong Cho sauce. What it really boils down to is Trey Yuen is the epitome of an American Chinese restaurant with a Louisiana accent and that's why I love it. As much as I love eating more authentic Chinese cuisine with its offal, stark flavors, and pungency, I have a special place in my heart for classic, American Chinese food. Sometimes you want the buffet fried rice & starchy sauces and that's when I go to Trey Yuen. FYI, The "chain" actually started in Hammond, in an old building and under a different name as I recall. It was possibly the first, or at least the first good, Chinese food to come to Hammond. It was really good. The Wongs made money hand over fist and opened the really nice place in Hammond. I'm not sure of the timing of the Mandiville place. That possibly was their first "nice" place. After the French Quarter place closed down I think the owners just slowed down a bit. They made a ton of money and are enjoying their families and being active members of the community. In the past few years I think the food has slipped a bit. All the ingredients are still super high quality food, but it just doesn't have the zing to me it once had. That said its still the best Asian food I've had in the south.